We offer FREE customized and flexible training programs, which are designed to systematically take our participants through our Core Fundamentals Program and then advance into a specific Career Track. Our focus is on Entry Level Information Technology (IT) roles, as they give our participants a starting point in one of the largest and fastest growing sectors in MN. In addition to being high in demand, these positions provide livable wages and significant career growth opportunities. Our participants should not have to worry about marketing themselves! So we do the marketing and placement for them— diverting their focus to learning the Core Fundamentals and Career Track materials that are essential for their success. As a strong believer in building relationships across sectors, Transcend IT has extensive partnerships with local companies and staffing agencies in the Twin Cities. We align interviews for each participant so that they get the opportunity to build their own brand and develop a sense of confidence in the process. Participants will work with dedicated trainers who deliver the material, mentors who advise both personally and professionally, and account managers who market their skills to obtain employment. This gives our participants the time and energy to immerse themselves not only in our program, but also focus on personal development. 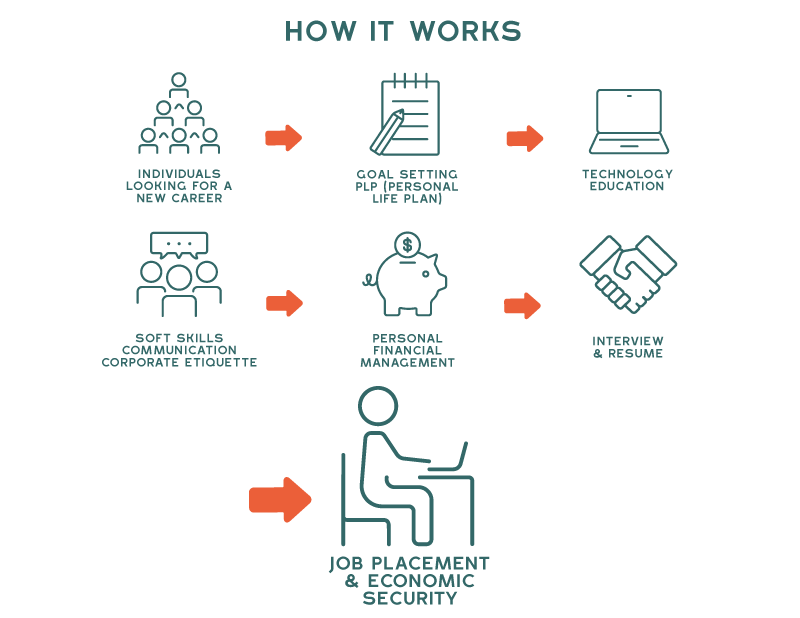 Our goal— to combine the best elements of a Non Profit + Technology School + Staffing Agency so that we can effectively train, place and support our participants in the career that they choose. Our Core Fundamentals + Career Tracks require a 2-3 month time commitment on a part time basis with a minimum amount of 12 hours per week. We meet our participants where they are at by providing flexible scheduling and training options. A portion of the training can be conducted at home but the majority of the training is done onsite with our experts to provide participants with in-class support, aiding to build their soft skills. With open classroom hours from 8 a.m. to 8 p.m. Monday through Friday— we give our participants flexibility to train in the evenings or a combination of day time and evening. The training is entirely self-paced based on each individual's needs. Each student also has the ability to expedite their training by completing the material anytime that works for them remotely.